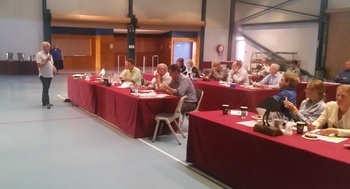 Food Futures conducted regional meetings in Douglas Daly and Katherine regions during August 2015. Over 60 attended including farmers, government agencies and landowners. Food Futures roadshows are an opportunity for people in the regions to participate in the discussion about developing agriculture in northern Australia. The roadshows featured presentations from Queensland, WA and NT Governments on developing agriculture in northern regions. Peanut Company Australia breeder Graeme Wright travelled from Kingaroy to give an update on PCA’s on-going interest in northern Australia. Gareth Jones from Queensland DAFF in Townsville travelled over to update the roadshows on developments in the Gulf, Cape York and other regions of Queensland. Jo-Anne Ellis travelled from Kununurra to talk about developments in the east and west Kimberleys including the Water for Food program in WA. Luke Bowen, CEO of NADO in Darwin, and Alister Trier, CEO NT DPIF spoke on developments in the NT. Prof. Michael Douglas (Charles Darwin University) spoke on water sustainability and the science behind good environmental water management. Minister for Primary Industries, Willem Westra van Holthe attended the Katherine roadshow. 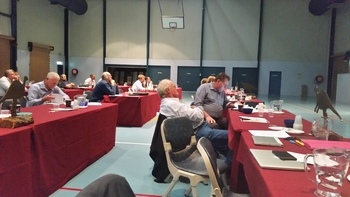 Farmers in the regions voiced their interests in developing agriculture in northern Australia. NT Farmers Assoc. Greg Owens ran farmer panels discussing issues in agricultural development including Chris Howie, Margo Black, Joe Scotney and Sam McBean at Douglas Daly and in Katherine farmers Sharon Shaw, Andrew Dalglish and Ken Raynor. NT Farmers Assoc. new CEO Shenal Basnayake was a very capable MC for both events. Regional Development Australia NT help fund the cost of Food Futures Regional Roadshows. 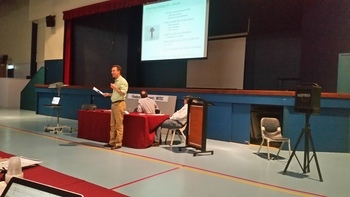 The Hughenden Food Futures Roadshow, on 2 July 2015, brought together people from across North-West Queensland and Cape York interested in developing cropping in the region. Around 50 people, including farmers and pastoralist, attended along with representatives from North Queensland Shire Councils, Government agencies, Agforce, and Flinders River Agricultural Precinct. Flinders Shire Council provided excellent support for the event. Regional Development Australia NT has sponsored NT Farmers to deliver the Food Futures Roadshows for Hughenden, Alice Springs, Katherine, Kununurra and Broome to follow the Northern Australia Food Futures Conference held in Darwin in Nov 2014. Many excellent presentations and good audience participation made for a great day (see the website). With NT Farmers providing the facilitation. Rainfall and water are the big issues to consider. Rainfall in the NW of Queensland (Gulf) is highly variable and groundwater is limited, so dams are the only answer. Rainfall on Cape York is much more reliable with better water opportunities. Qld DAF are doing some work in the region, but there could be a greater emphasis on the NW Region and Cape York, especially considering the work being done by the WA and NT governments. Shires in the region are a great ally for agriculture in NW Queensland. The large size of the pastoral industry means it is a significant part of future cropping development.